My heart is full to overflowing with gratitude and joy. On Sunday afternoon our children threw a garden party. Oh, what a party it was. Beautifully decorated tables, delicious food, and the very best of guests. The party took place in Vancouver and my siblings and parents from Chilliwack attended, as well as one sister-in-law from Alberta. We were all asked to dress in blue, for this was a "dinner in blue," a riff on the "diner en blanc." The three grandchildren were completely enchanted with Auntie Ashley's chickens to the point that they barely engaged with anyone else. Greatest child-minders ever! They picked bits of grasses and leaves to poke through the holes - a sample menu - said the 6-year-old. The celebration was in honour of our 40th wedding anniversary. I just can't quite believe that we've been married that long. It's been full of more ups than downs, more laughter than tears, and more joys than sorrows. There's something utterly elegant about using china plates and delicate glassware outdoors. I felt like I was in a scene from a movie. Do you remember when Karin Blixen's character in Out of Africa went camping? Mozart under the stars, white linens (and plenty of servants). There were no servants yesterday, just some very hard-working children, but the atmosphere was the same. Flowers and herbs gathered from the garden (and the sidewalks) combined in airy, casual bouquets on the table. We took some casual photos after dinner - here with my parents, my sister and her husband, and two sisters-in-law. Those who could, came, and those who couldn't sent best wishes. Then with our children, their spouses and the grandchildren. Happy faces all around, and doesn't all the blue make for a harmonious photo? Oh, these grands. This was a silly photo, but so full of life and fun. I love it. Then there was cake - a gorgeous creation by our daughter-in-law. It tasted just as good as it looked! Tea or coffee and cake in the garden. Simply wonderful. There are many superlatives in this post, but I did restrain myself. Really. It was such a special time and I'm so grateful for my husband, our families of origin, and our own family. Truly, we have been given much. My heart is warmed by this joyful post highlighting your milestone anniversary celebration! Joyful occasion, joy-filled faces! Even in a time that is marked by struggle and loss, we have so much for which to be grateful. Our good God has given generously! Your children planned such a beautiful and elegant party! Love all the blue! What a perfect occasion for you to enjoy. The blue theme just seemed so right, from dresses to flowers. A lovely anniversary! How wonderful. Congrats to you and your husband. Love the all the blue, such a cute idea. What a wonderful and memorable occasion for you both and all organised and arranged for you both by your children - you must feel very cherished. Your 40th Anniversary celebration looks absolutely wonderful, Lorrie! Congratulations to you and your husband. Ours is coming up on August 6 but we don't have a thing planned and I would love to have a party in our yard. It seems every time I have company over for a bbq or reunion we get rained on so I'm afraid to organize it and get rained out yet again. lol I wish you both many more wonderful years together! Blessings. How wonderful! Happy Anniversary! What pure joy this must've been. Love the hats and all of it really! HAPPY ANNIVERSARY! :) Your family clearly 'pulled out all the stops' to make it a memorable celebration ! Congratulations on the ruby wedding anniversary! A blue-themed party is the perfect way to celebrate your milestone anniversary with family. Loved all the family shots and the photo of the blue cake with the teacups! I can't think of a nicer way to celebrate this special moment in your lives. Happy Anniversary to you both. Your children thought of everything to make this a most memorable celebration. You must feel so proud and well-loved. Beautiful photos! Oh how very lovely. You really were celebrated well. Love the blue theme and all the decor. Happy Anniversary to you! I feel the love of family in this post, and the photos are so full of smiles they make my heart sing! Forty years! How wonderful! You have a lovely family and this was the perfect celebration. Thank you so much for sharing, Lorrie! Congrats, a bit late but wished anyway. What a party. I love the blue theme and all those gorgeous pictures. Oh, and I love your hat. Love a gal in a straw hat! Thanks for sharing all of that with us. How absolutely fabulous! Happy Anniversary to you & your dear husband, what a gala party it was. Love the idea of the blue and white theme, the table setting looked splendid, the casual bouquets and china so stylish, and that cake! Lorrie, Congrats on the anniversary. What a great party. Have a great weekend. Sylvia D.
wonderful party celebrating a real and joyful reason for throwing one. Everyone looks great in blue! Congratulations to both of you on your Anniversary .... your words in celebration of love and family are perfect. Happy Anniversary, Lorrie & Mr. What a lovely party!! So pretty with all the shades of blue. Congratulations on such a great family event...good kids...well trained! Congratulations to you and your husband on your 40th wedding anniversary. Your children honored you and your hubby in such a wonderful and creative way. By the smiles on all you faces, everyone enjoyed the party. Lorrie - congratulations to you and your hubby on 40 years. I am confident I will make it there with Spousal Unit, and yet it is always good to see someone who has gone before and everyone looks so HAPPY! Clearly, your kids treasure both of you and have honored you with a celebration that is beautiful in every way! Thanks for sharing this very personal event with us! Happy Anniversary! I hope you have many wonderful more years of marriage. A beautiful party and lovely photos! Oh my goodness! How absolutely lovely of your children. I adore the blue theme. Everything looks so beautiful and everyone so happy. Happy anniversary and blessings for many, many more. Oh my gosh. The BLUE theme was such a good idea. I will copy it for a party for sure. Everyone dressing in a similar color makes all the photos POP. I LOVE the cake too. What flavor was inside? Im very happy for you! Glad I decided to visit a few blogs today, the garden party was lovely. Nice family photos I loved the blue and white coffee/dessert table. Happy anniversary. We celebrated 45 years on July 1 and like you, we don't know where the years have gone. What a wonderful celebration. The family worked so hard to honor your anniversary an to make your anniversary memorable. You will have these treasured memories to enjoy. Forty years is a long time, and would not have had it another way, would we? Congratulations and Happy Anniversary. Ah .. this is beautiful! I can only imagine ... and wonder how you kept your post so short! Loved the photos and the feel of the love poured into this celebration. Yes, we both had the best weekend with garden parties and all! Parabéns pelos 40 anos de casados. 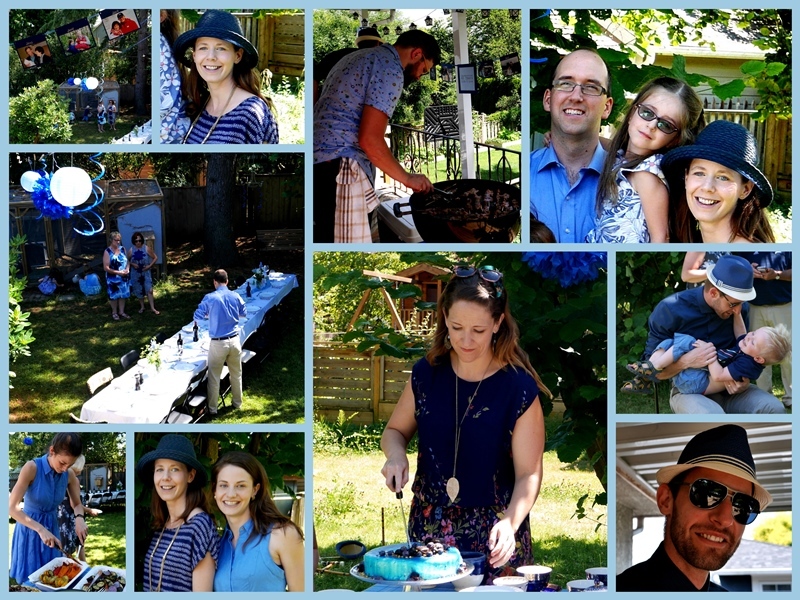 What a wonderful celebration, Lorrie, and the blue theme made it even more elegant. Congratulations on the 40 happy years! Oh Lorrie, what a joyous post! Happy 40th Anniversary to you and your hubby!!! I have happy tears in my eyes on seeing all the pictures, and knowing the time and effort put forth from your dear family. I remember having 40th anniversary parties for both my parents and my late beloved's parents. Thank you for bringing back those memories. What a lovely garden party. A very special way to celebrate. Happy 40 years for sure! Love the blue theme. I know it is your favorite color too. Your family was so thoughtful to plan this celebration. Belated congratulations on your big anniversary dear Lorrie. Your lovely family certainly made it a special day - loved the blue theme, is that your favorite color? Your daughter's cake is awesome too.